Theoretical physicists try to understand the Big Bang and how the universe ended up the way it is today. One theory scraps a spatial dimension to better describe the strange behaviour of the early universe. Now, an international group of physicists found they could recreate actual physical data collected on our universe using this 2D holographic model. “It’s holographic in the sense that there’s a description of the universe based on a lower dimensional system consistent with everything we see from the Big Bang,” Niayesh Afshordi, the study’s first author from the University of Waterloo in Canada, told Gizmodo. The researchers built a model with one time and two space dimensions from this insight, and plugged in real data on the universe, including cosmic microwave background (CMB), invisible light from several hundred thousand years after the Big Bang that hits Earth from all directions. The model accurately recreated the behaviour of thin slices of the CMB, but cannot recreate slivers of the universe more than 10 degrees wide, which would require a more complex model. 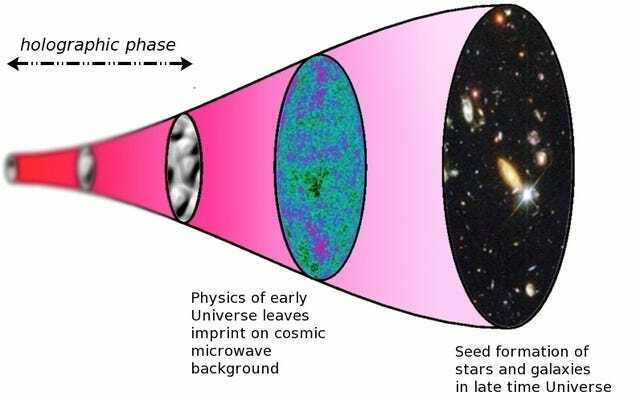 Afshordi explained the scientists didn’t prove that the early universe was a hologram, but rather, found that they couldn’t rule out holographic models. They published their results in the journal Physical Review Letters on Friday. As for the universe in 2017, Ashfordi himself told me: “There are definitely three dimensions."